I realised upon completing my old man portrait study that I needed to work with fiction and apply my study. One needs to get the balance right between study and ‘practise’. 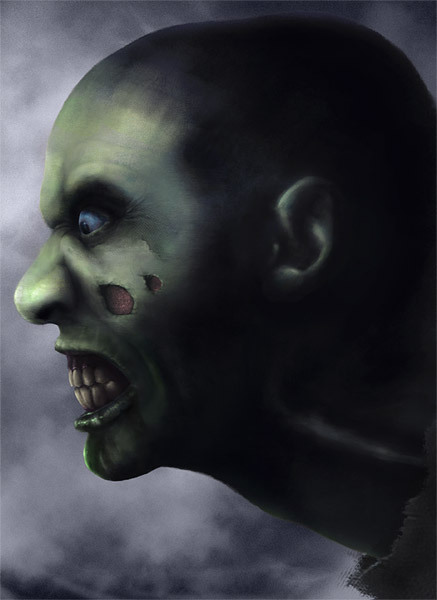 So I figured that I’d go without reference and create another side-profile portrait and that I’d make it interesting and create a zombie portrait. Pretty garbage if you ask me. I wasn’t happy at all and knew I could do better. But then I had no reference whatsoever and was pretty new to portraiture. 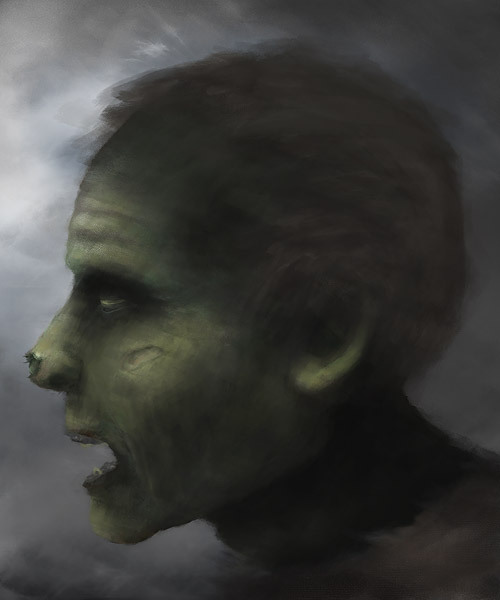 I figured I’d get the reference I needed to construct the head but then embelish the zombie aspect – a fairer deal than embelishing the entire piece! 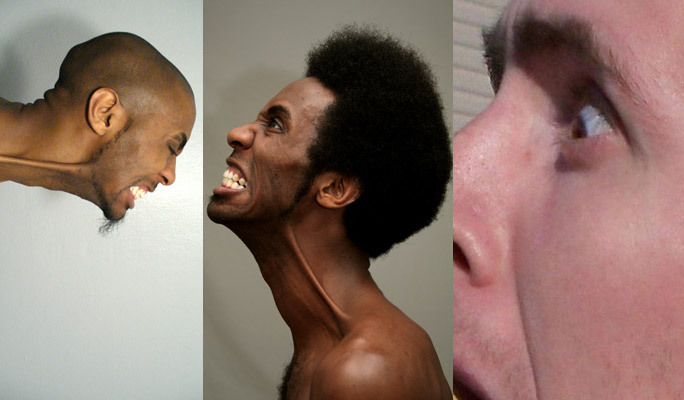 After half a day of scouring deviantart.com I came across these images. I was pretty exhausted as I’d set myself up for full side-on profile shots only AND they had to be grimmacing! I also photoshopped him a little to bring out shadows and also added some wrinkles from another photograph. At this stage, in terms of copywrite, you can use anything because it’s just reference. http://ahrum-stock.deviantart.com/ – the afro dude. Click the above image to see it full size. I just lay down some guides on the left and then made my own guides based on those. It’s up to you as to whether you want to do this and you aren’t wedded to your guides but they help lay the foundations. I then blurred and greyscaled the reference and copied that so I could keep away from detail and focus on getting the 3d form. The canvas is 3000px high and 300 dpi. So I threw down a basic colour tone and then the basic features plus a harder outline. Things are still very rough at this stage. Now I’m using my trusty chalk brushes to block in and solidify the mass, making it less blurry and starting to work in a light source and stronger colour tone. At this stage I’m not happy with the mouth and feel the painting looks a little 2d overall, but particularly in the mouth area. I took a break from the face and decide to work up his ear as it was a little distracting having him earless! 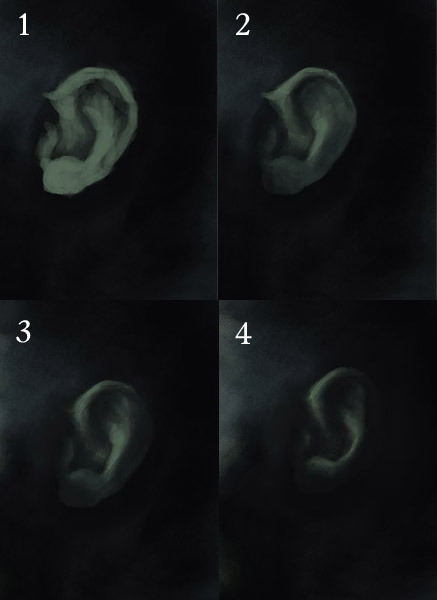 Zombie Digital Painting Tutorial – Step 04: Zombie Ear! I basically had the light source coming from the front and his ear was partially obscured from the light by his cheek bone. Here I’m just bringing up the cheek bones and other areas that stand out, building it up using very transparent chalk brushes at around 10% opacity until it gets lighter and lighter. 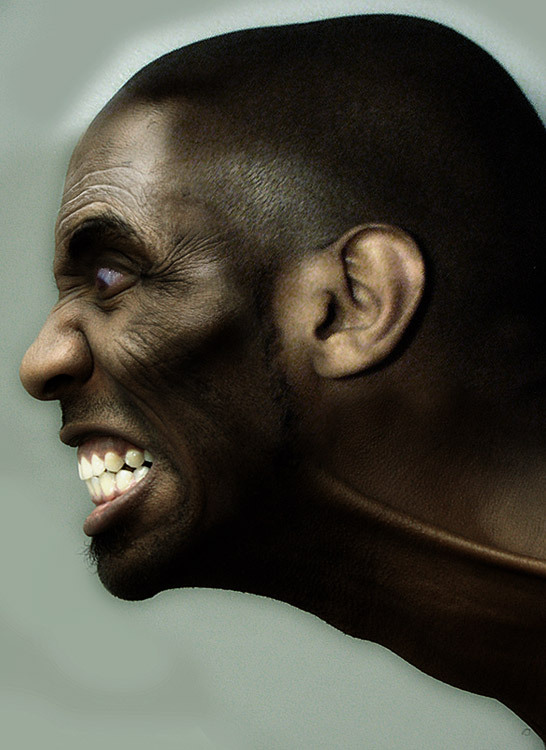 Was never happy with the teeth so out came the digital dental equipment… umm, my pen tablet? I took the source photo and lasso’d out this teeth and dragged them into a layer right next to my zombie mouth so i could get a good look. NOTE: If something is bugging you in a painting – it GOES. Period. This is how you get better. This stage was a significant step for me. I wasn’t content until this stage! The eye was under developed and he didn’t look like he was snarling. I went back to the reference and really studied his nose and cheeks and how they worked together. The eye needed to look more dramatic too. Now, if you look at the reference you will not see a relationship between his forehead and that of my zombie. It was here that I started to see the zombie’s brow form out of nowhere and just went with it. I began to slowly step away from the reference once the finer details began to form. NOTE: It was here that, having showed my zombie to a few fellow artists, it fully hit me that I didn’t have any decent lighting reference. I was making up my own front-facing light source which isn’t an ideal direction. It’s very important to have lighting reference and shouldn’t be considered a secondary requirement! I just had to make the most out of what I did have and chalk this one up. I wasn’t happy with the ‘C’ shaped mouth curve so I did a fair bit of paint-overs and erasing until I felt a little better. 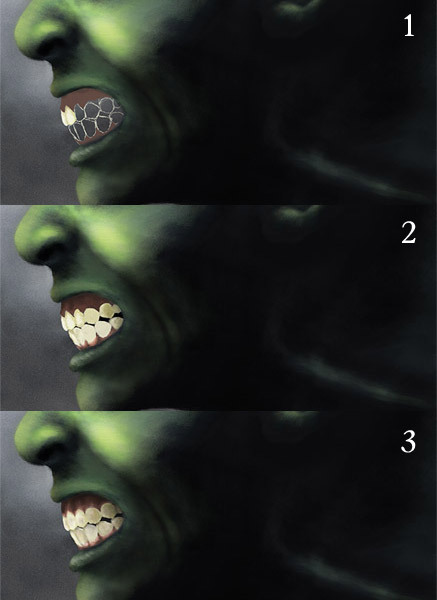 The teeth also needed darkening a lot! He looked too fresh and sparkling. That said, I STILL wasn’t happy with the mouth. Stubborn thing. 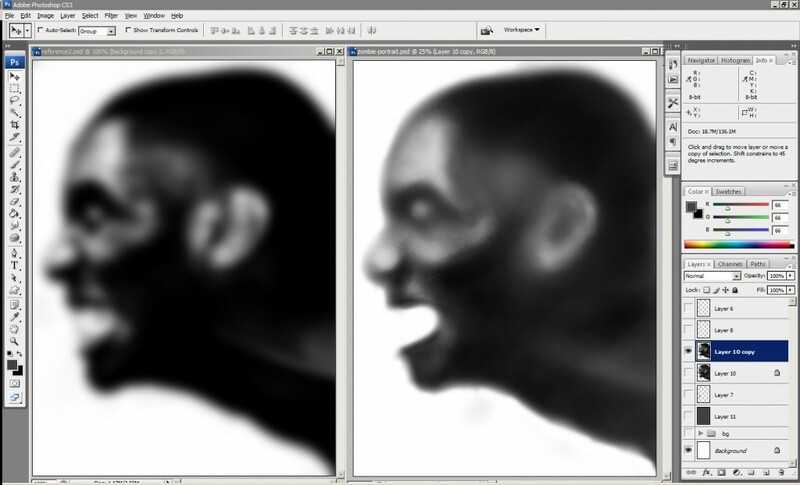 Here I CTRL+SHIFT+C copy merged and pasted a new mouth, made it bigger and blended it back in. The mouth was too small. I feel it looks a bit better now. I also made the skin tone a little less incredible hulkish. 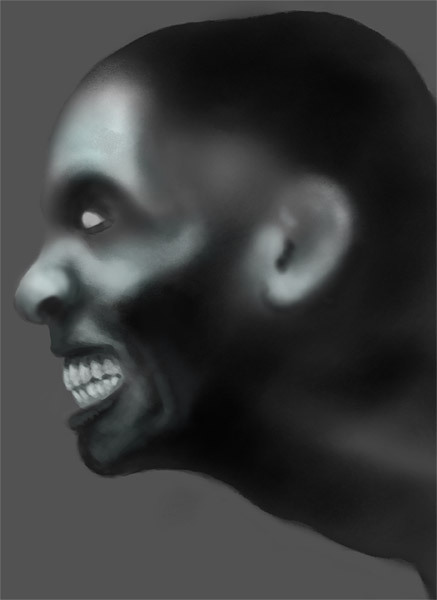 I felt the jaw/front of the face was falling away too steeply, so similar to the previous technique of copying the merged layers, I pasted the lower part of his face and rotated it. As it happens, this didn’t cause too much bother – a little erasing and it fitted back in quite seemlessly. I also added in a shabby hessian top. This was pretty simple. 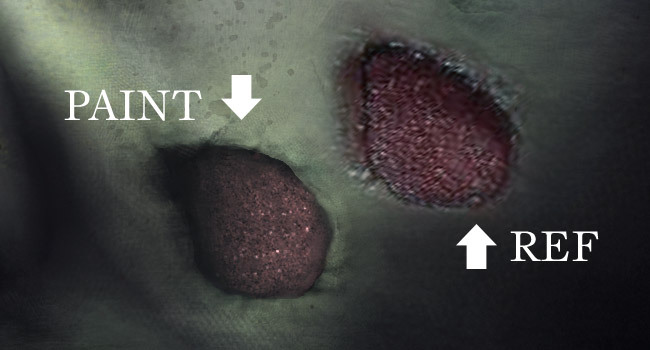 The texture was created using fabric brushes – just about any will do for something like this which we’re not really going to see too much of. You’ll also notice a few signs of wear on his face. You have to be so subtle with this kind of thing. I was even using brushes at around 5% opacity for this, building up tones that were just slightly lighter or darker than the neighbouring flesh tone until a line could be put down. NOTE: Create new layers often! If you’re unsure about refining a part of your portrait, for God’s sake make a new layer – this is what the digital medium is useful for. You can experiment with impunity this way and learn a lot! 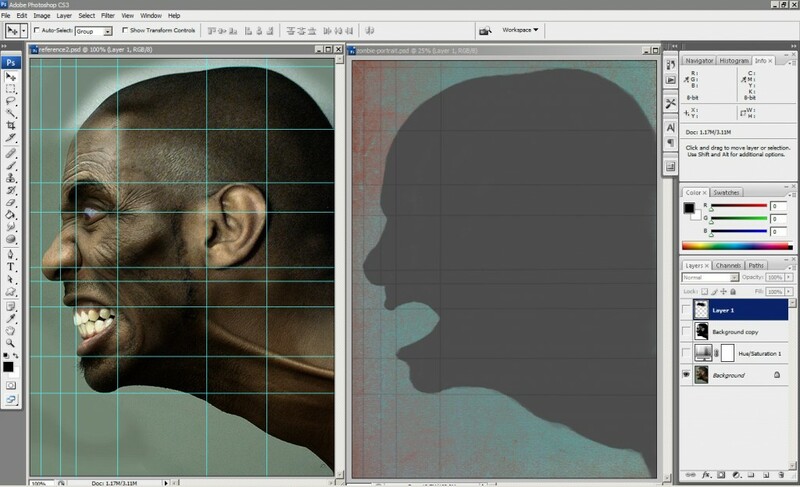 Use a light colour (or pure white), select ‘color dodge’ from the mode drop down and set your opacity to around 10%. Also, you’ll need to merge your layers so you’re working directly on your finished layer composition. So I searched around on google images and found the above reference from a prosthetic hand-wound. 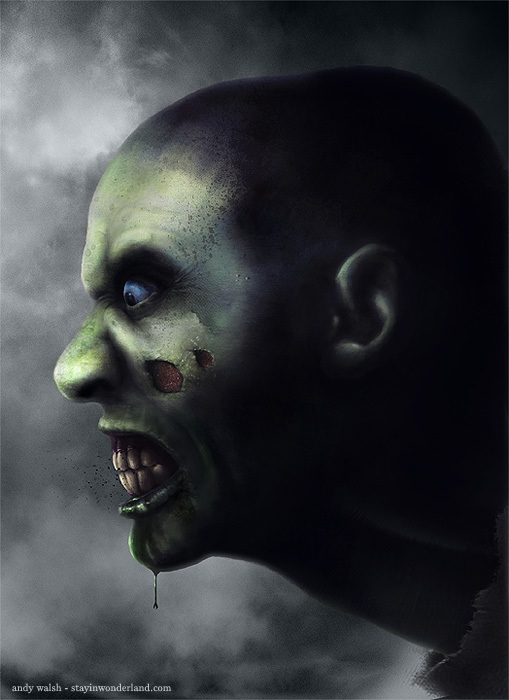 I copy-pasted it next to my zombie’s cheek and set about emulating the scabby thing. 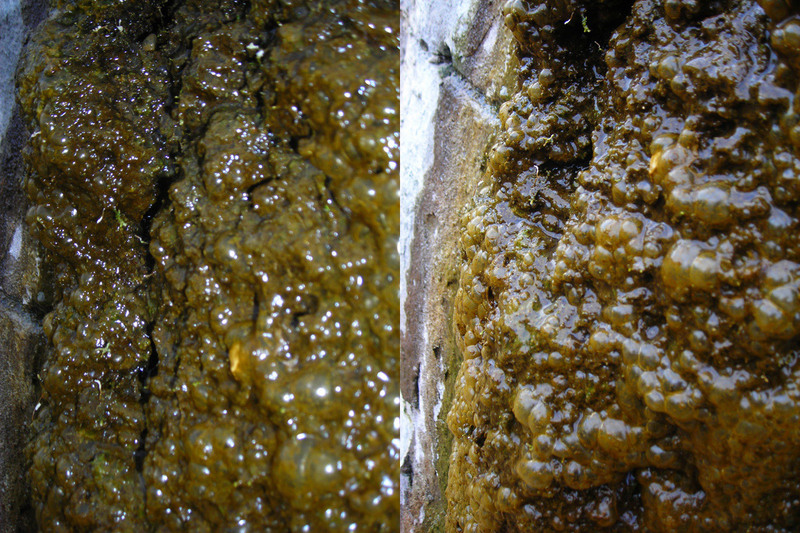 I also created some chin slime which was a new one for me. 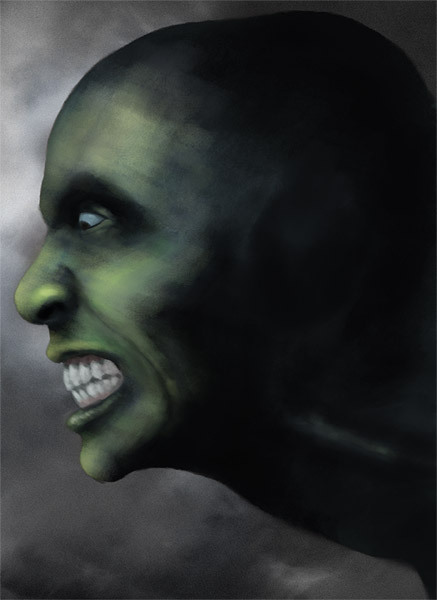 I just went almost black/green and striped down his chin and lips. I then got out the trusty dodge brush and made some highlights, picking out the apex of the curves where the light would reflect the most (see the lip). So I went to work on his skin creating a few creases, stains, warts and splats. I feel the thing that really makes it is the drool. This was real simple, I just painted in a straight line, made a basic tear drop shape at the end and then dodged the highlight in. They key was making it look very straight as goo will fall in a very clean line. You’ll also notice an overall grade in contrast. This is often done last of all where you flatten your subject and use the photoshop image adjustments to tweak the values. So, I hope you like this tutorial! In conclusion, I think the path I followed was to attempt painting without any reference, get much better reference and then to hone my painting UNTIL I was satisfied. In that little journey I learned that good lighting needs to be part of your reference. I also learned that you should never stop until you’re happy! That being said, there does come a time when you have to put the painting down, note your mistakes and move on to the next study. I’m not 100% hapy with my zombie but that’s ok because to achieve that 100% would a) take ages and b) be primarly ego-driven. But I am a million percent happier than when I did my first zombie attempt! Come back soon, tell your friends about me and follow me on twitter for updates and cool digital painting links! 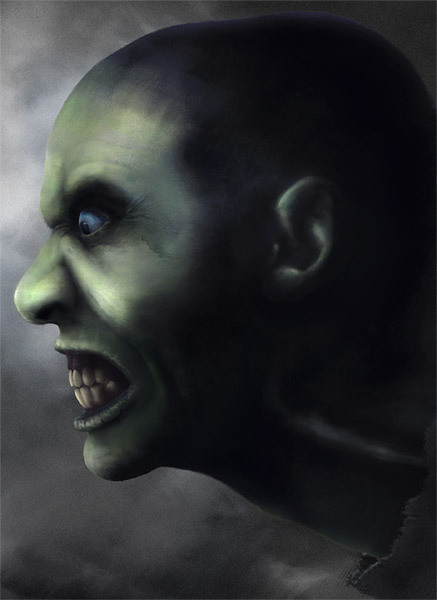 This entry was posted in Digital Painting Tutorials and tagged digital painting, digital painting tutorial, head, portrait, zombie. Bookmark the permalink.